1 his small, bird-hunting hawk has broad wings with narrow-tipped primary feathers that splay out like fingers when the bird soars. Its tail is long and broad. It is a woodland bird that hunts by maneuvering in low flight between trees and bushes, taking songbirds by surprise and capturing them in brief, sprinting chases. In higher and more open flight or on migration, it seems to lack power and travels slowly. As it passes, parties of small, fast-flying birds such as Common Starlings or Swallows (see pp. 270, .175) "mob" the Sharp-shinned Hawk, flocking round it with mock attacks. 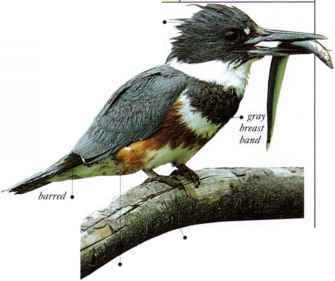 • NEST A platform of sticks and twigs, lined with bark, smaller twigs, and feathers, and built in a tree. • DlSTUIBl JTION Breeds in North America and Mexico. Northern and mountain populations winter in southern parts of this range. • REMARKS Females are larger than males. Observations reveal that the two sexes reduce competition by taking slightly different sizes of prey, thus sharing the available food supply.